This topic describes how to write a Universal Windows driver using Kernel-Mode Driver Framework (KMDF). You'll start with a Microsoft Visual Studio template and then deploy and install your driver on a separate computer. To get started, be sure you have Microsoft Visual Studio 2015 and the Windows Driver Kit (WDK) 10 installed. Debugging Tools for Windows is included when you install the WDK. Open Microsoft Visual Studio. On the File menu, choose New > Project. The New Project dialog box opens, as shown here. In the New Project dialog box, select WDF. In the middle pane, select Kernel Mode Driver (KMDF). In the Name field, enter "KmdfDriver" as the project name. When you create a new KMDF or UMDF driver, you must select a driver name that has 32 characters or less. This length limit is defined in wdfglobals.h. In the Location field, enter the directory where you want to create the new project. Check Create directory for solution. Click OK. 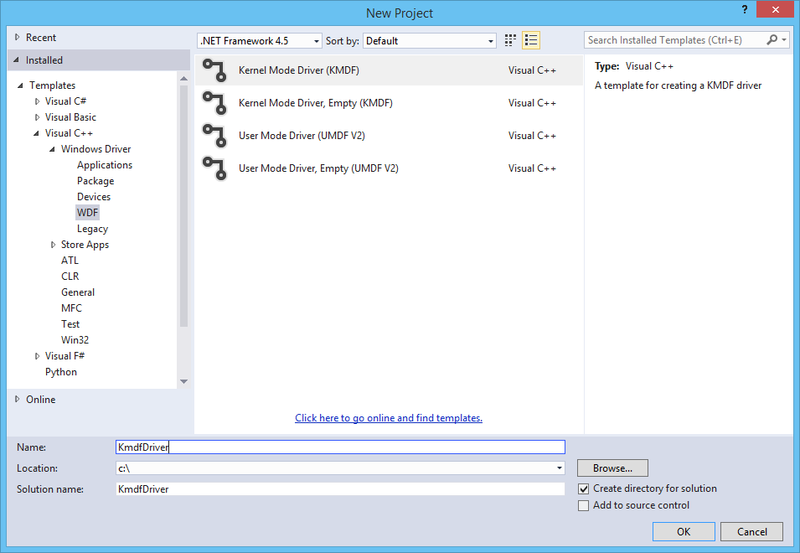 Visual Studio creates one project and a solution. You can them in the Solution Explorer window, as shown here. (If the Solution Explorer window is not visible, choose Solution Explorer from the View menu.) The solution has a driver project named KmdfDriver. To see the driver source code, open any of the files under Source Files. Driver.c and Device.c are good places to start. In the Solution Explorer window, right-click Solution 'KmdfDriver' (1 project), and choose Configuration Manager. Choose a configuration and platform for both the driver project and the package project. In this exercise, we choose Debug and x64. When you've verified that the solution built successfully, you can close Visual Studio. Typically when you test and debug a driver, the debugger and driver run on separate computers. The computer that runs the debugger is called the host computer, and the computer that runs the driver is called the target computer. The target computer is also called the test computer. For more information about debugging drivers, see Debugging Tools for Windows. So far you've used Visual Studio to build a driver on the host computer. Now you need to configure a target computer. Follow the instructions in Provision a computer for driver deployment and testing (WDK 10). When you follow the steps to provision the target computer automatically using a network cable, take note of the port and key. You'll use them later in the debugging step. In this example, we'll use 50000 as the port and 1.2.3.4 as the key. In real driver debugging scenarios, we recommend using a KDNET-generated key. For more information about how to use KDNET to generate a random key, see the Debug Drivers - Step by Step Lab (Sysvad Kernel Mode) topic. On the host computer, open your solution in Visual Studio. You can double-click the solution file, KmdfDriver.sln, in your KmdfDriver folder. In the Solution Explorer window, right-click the KmdfDriver project, and choose Properties. 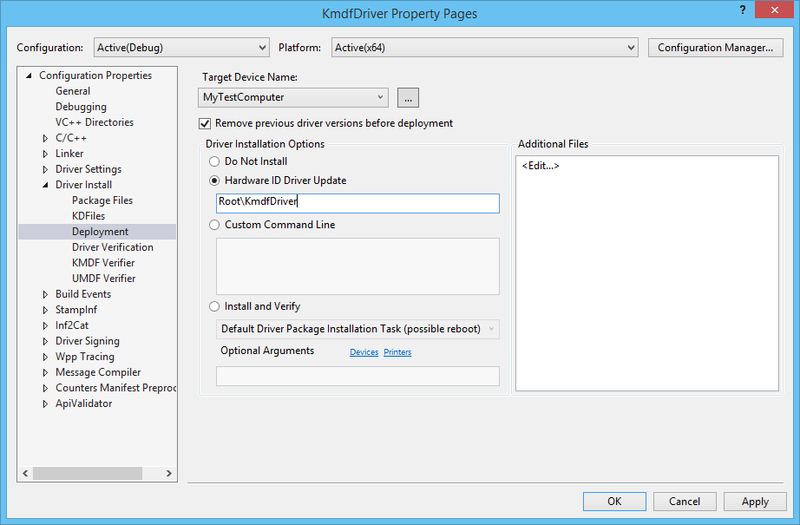 In the KmdfDriver Package Property Pages window, in the left pane, go to Configuration Properties > Driver Install > Deployment. Check Remove previous driver versions before deployment. For Remote Computer Name, select the name of the computer that you configured for testing and debugging. In this exercise, we use a computer named MyTestComputer. Select Hardware ID Driver Update, and enter the hardware ID for your driver. In this exercise, the hardware ID is Root\KmdfDriver. Click OK. In this exercise, the hardware ID does not identify a real piece of hardware. It identifies an imaginary device that will be given a place in the device tree as a child of the root node. For real hardware, do not select Hardware ID Driver Update; instead, select Install and Verify. You'll see the hardware ID in your driver's information (INF) file. In the Solution Explorer window, go to KmdfDriver > Driver Files and double-click KmdfDriver.inf. The hardware ID is located under [Standard.NT$ARCH$]. On the Build menu, choose Deploy Solution. 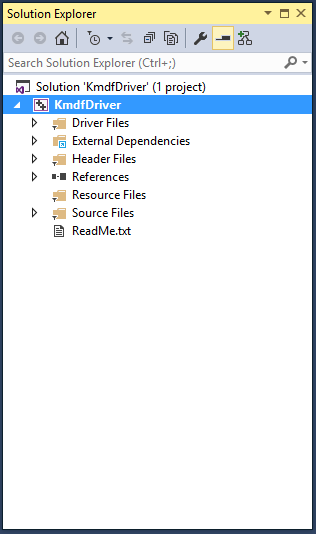 Visual Studio automatically copies the files required to install and run the driver to the target computer. This may take a minute or two. When you deploy a driver, the driver files are copied to the %Systemdrive%\drivertest\drivers folder on the test computer. If something goes wrong during deployment, you can check to see if the files are copied to the test computer. Verify that the .inf, .cat, test cert, and .sys files, and any other necessary files, are present in the %systemdrive%\drivertest\drivers folder. For more information about deploying drivers, see Deploying a Driver to a Test Computer. With your KMDF driver deployed to the target computer, now you'll install the driver. When you previously provisioned the target computer with Visual Studio using the automatic option, Visual Studio set up the target computer to run test signed drivers as part of the provisioning process. Now you just need to install the driver using the DevCon tool. Copy the DevCon tool to your remote computer. On the target computer, install the driver by navigating to the folder containing the driver files, then running the DevCon tool. The INF file required for installing this driver is KmdfDriver.inf. The INF file contains the hardware ID for installing the driver binary, KmdfDriver.sys. Recall that the hardware ID, located in the INF file, is Root\KmdfDriver. A dialog box will appear indicating that the test driver is an unsigned driver. Click Install this driver anyway to proceed. Now that you have installed your KMDF driver on the target computer, you'll attach a debugger remotely from the host computer. Launch WinDbg to connect to a kernel debug session on the target computer by using the following command. The value for the port and key should be the same as what you used to provision the target computer. We'll use 50000 for the port and 1.2.3.4 for the key, the values we used during the deploy step. The k flag indicates that this is a kernel debug session. On the Debug menu, choose Break. The debugger on the host computer will break into the target computer. In the Debugger Command window, you can see the kernel debugging command prompt: kd>. To let the target computer run again, choose Go from the Debug menu or press "g," then press "enter." To stop the debugging session, choose Detach Debuggee from the Debug menu. Make sure you use the "go" command to let the target computer run again before exiting the debugger, or the target computer will remain unresponsive to your mouse and keyboard input because it is still talking to the debugger. For a detailed step-by-step walkthrough of the driver debugging process, see Debug Universal Drivers - Step by Step Lab (Echo Kernel-Mode). For more information about remote debugging, see Remote Debugging Using WinDbg.